The challenge, the drama and the sense of freedom. 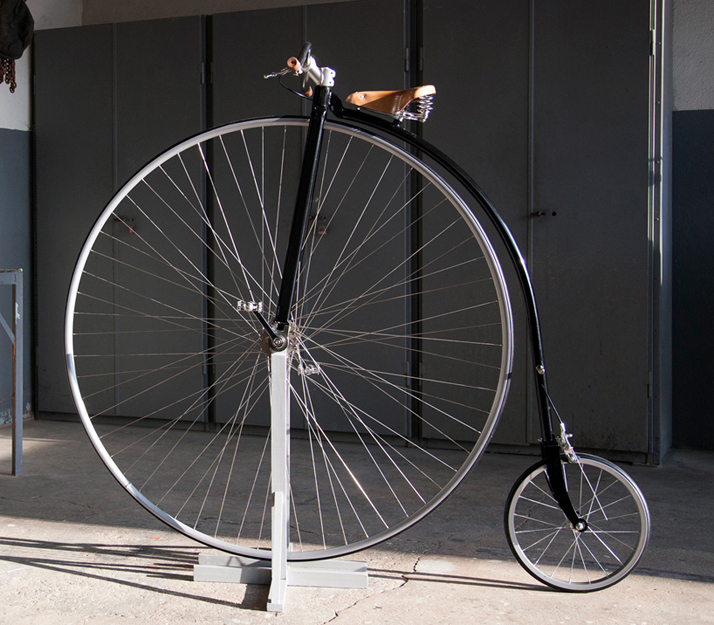 Why high wheel bicycles in the 21st century ? The challenge, the drama, the sence of freedom and the posibilty that bicycles originally offered are vividly present with high wheel bicycles. The unlikely marriage of man and machine that cycling entails becomes obvious to all on a highwheeler, when it has been lost by the ubiquity of conventional bikes. Quite simply, the larger the front wheel the faster you go and the problem is not, as you might imagine, going uphill but keeping control while coming downhill at breakneck speed. 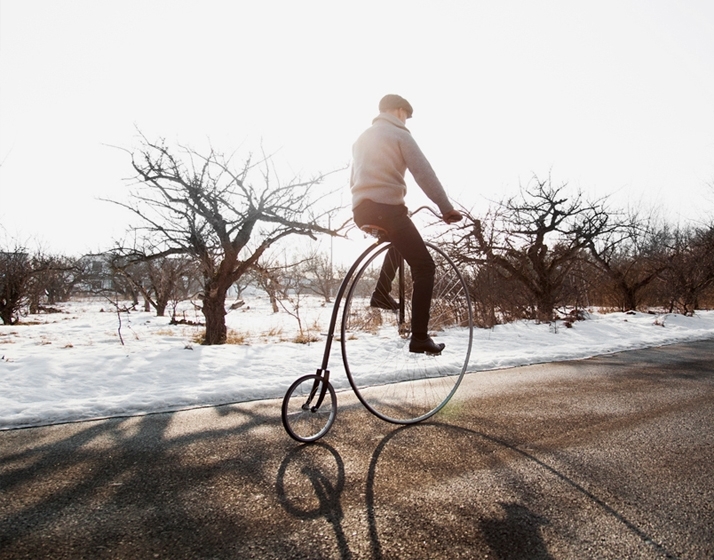 Perhaps not easy, but it is actually not that difficult to ride a high wheel bicycle. Most people learn it within an hour. To mount it the rider scoot forward with the right leg, while the left foot remained on the mounting peg. When the rider has enough momentum, he (or she) slip forward on to the saddle and then begin pedaling. This move is a piece of acrobatic but when you know how to do it, then you just do it. Art of engineering. 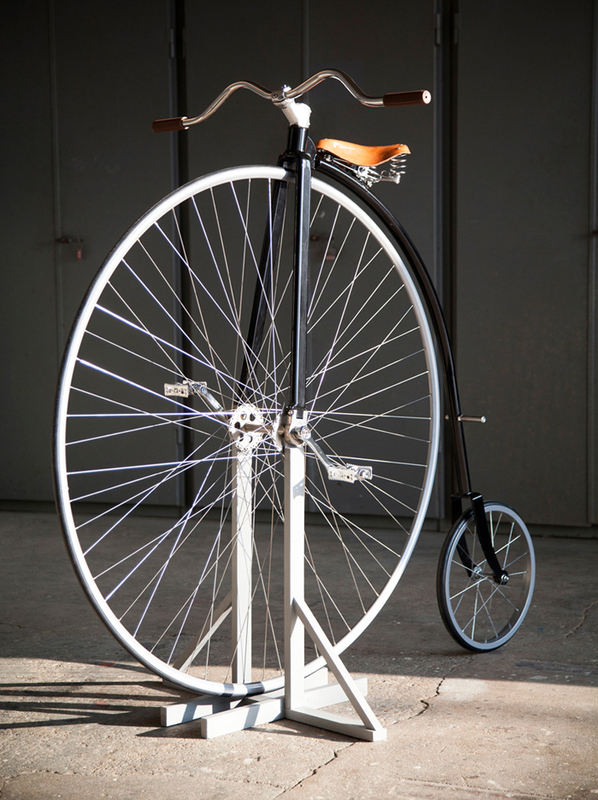 A high wheel bicycle is direct drive, meaning the cranks and pedals are direct to the hub. 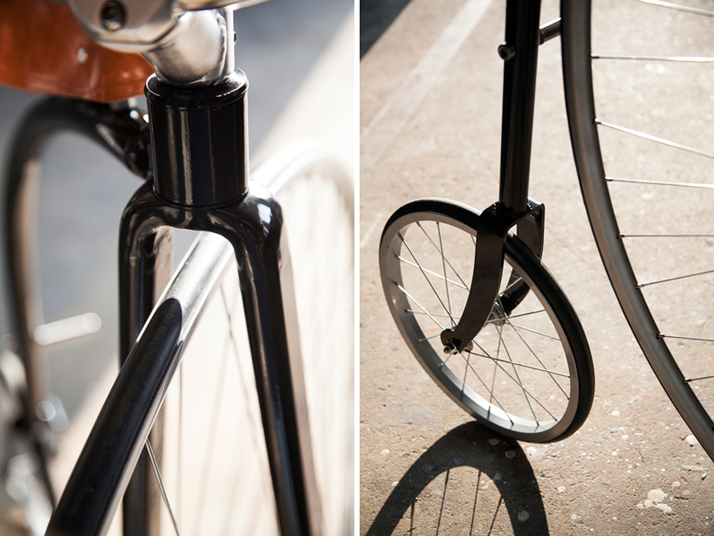 The front wheel can be enlarged to close to the rider´s inseam to increase the maximum speed. The bigger wheel the faster bike. The frame is a single tube following the circumference of the front wheel, then diverting to a trailing rear wheel. It is all very simple, still a piece of art to construct and build. 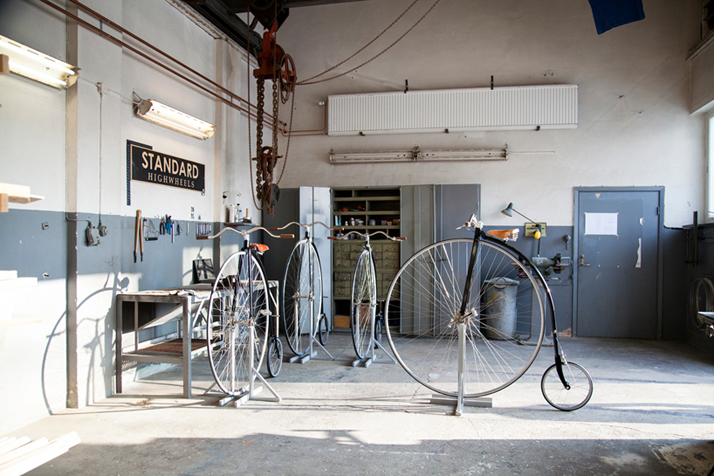 "Our high wheel bicycles are build all by hand. Still, the price does not exceed what you pay for a ”normal” bicycle of the same high quality." 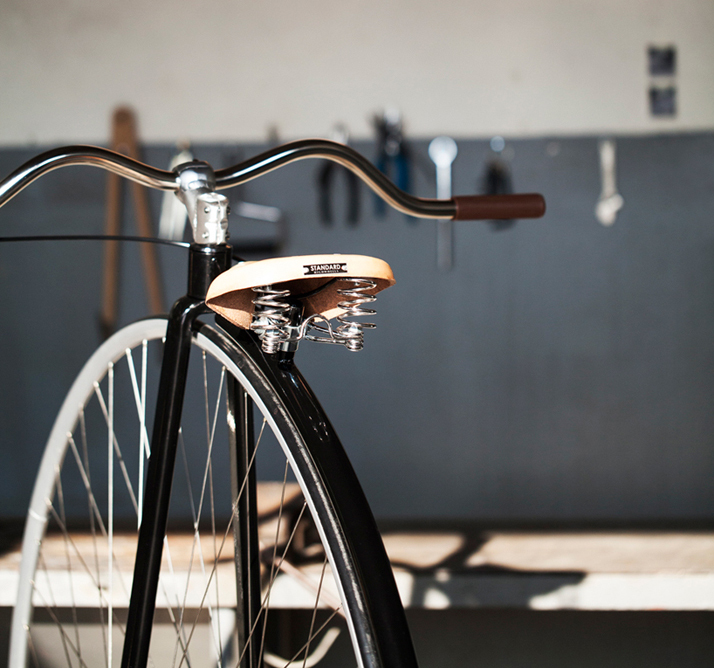 All parts and components are carefully designed and selected to make this bike to what it is; a wonderful bike to ride and a piece of art to look at. 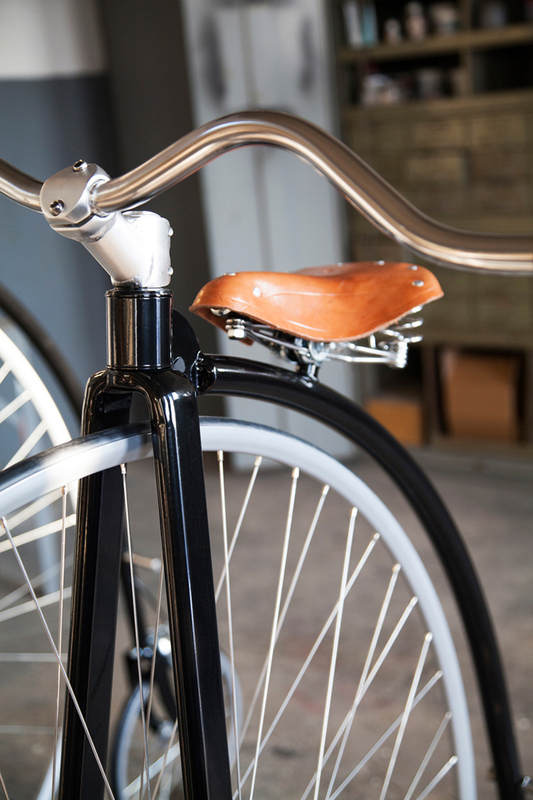 The stainless handlebar has its nice shape, the classic saddle in leather, the shiny fixed hub and the beautiful pedals. All together a jewel. A jewel to use. It comes in two sizes, 48″ and 52″. The taller rider, the bigger bike. Riders up to about 177 cm are recomended to choose the 48″. The 52″ bike fits for riders taller than that. 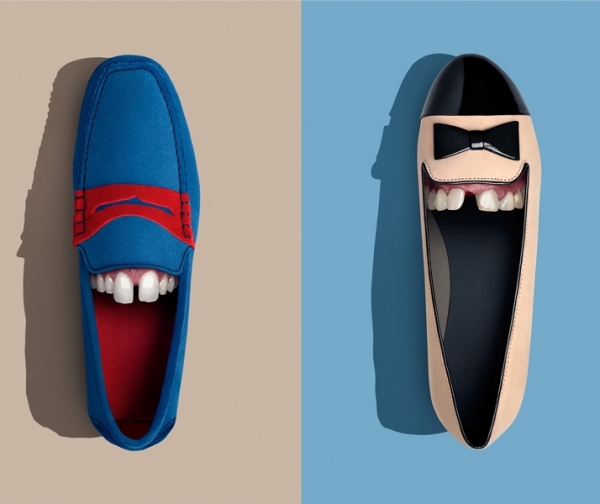 But in the end it´s also a bit individual. Real tall riders (above 188 cm) should probably order a 56″ (special order). Short riders (under 166 cm) should order a smaller bike (special order). The fit of the bike can also be slightly adjusted by changing the crank arm length. You can order your bike with an elegant caliper brake on the rear wheel and this will in particular help when dismounting the bike. To slow the bike down when riding you put pressure on the pedals in reverse. Standard Highwheels was established in 2013 by swedish architect Per-Olof Kippel. ” I had a vision of a high wheel bicycle for € 1000. But it should not only be affordable. It should also be of highest quality, and that combination (price and quality) I couldn´t find somewhere. It took some time and I had to give up the 1000 € goal, but finally it was there. The bike was now priced at € 1500 but the ambition of quality was fullfilled and even succeed.” Standard Highwheels is a company, a project and most of all a fantastic bicycle for those who are not afraid to stand out, for those who are close to passion, joy and perhaps a touch of madness. 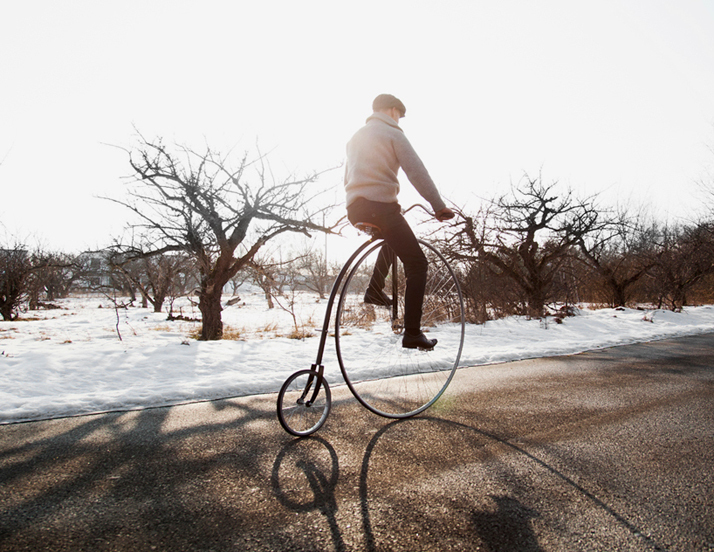 The experience of riding a high wheel bicycle is simly superior to the one of a regular bike.